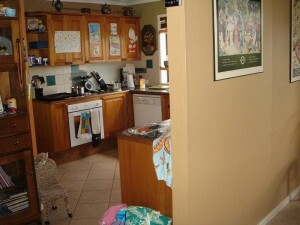 It is great to see “Before” and “After” photos so I wanted to share this kitchen makeover with you. My client wanted a modern, fresh kitchen that would still go with the floor tiles that were not being replaced. White cupboards tend to be classic, timeless and popular, and along with the white caesarstone benchtop, made the whole kitchen look much brighter and more spacious. We chose pale grey / green for the splashback, which reflected the the colouring of the beautiful garden just outside. 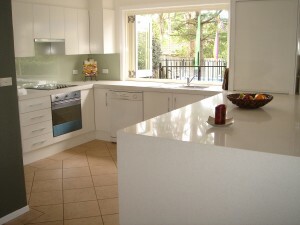 My client was very happy with the result and looks forward to coming down to her newly renovated kitchen each morning.